Directions: When applying for a Florida driver's license, applicants must take and successfully pass a a knowledge exam. Must drive slowly to allow approaching vehicles and pedestrians time to get out of your way. Must honk your horn so approaching vehicles and pedestrians know to give you room. Must stop and proceed only when there are no pedestrians or vehicles approaching. Can disregard any pedestrians if there is no sidewalk. Always stop before entering the roadway from a driveway and yield to any approaching vehicles or crossing pedestrians. The stop should be made before crossing the sidewalk area. Failure to stop is unlawful. 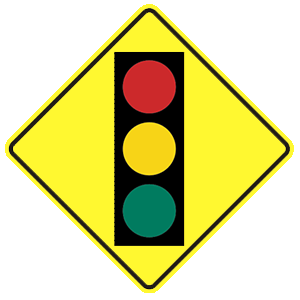 This sign warns that a traffic signal is ahead. If you drink alcohol, even just one drink, your chances of being in a crash are much greater than if you did not drink any alcohol. No one can drink alcohol and drive safely, even if you have been driving for many years. Keep driving until you see the vehicle. Pull to the curb and look to see if it is on your street. Slow down. Don't stop until you see it. Speed up and turn at the next intersection. If you hear a siren or an air horn close by but do not know exactly where the emergency vehicle is, safely pull over to the right side of the road and stop until you are sure it is not headed toward you. A term used to describe blind spots around a truck or bus. A roadway with restrictions on vehicle stereo volume. The television show that replaced The Twilight Zone. Your tires become less effective at clearing water from the road as you increase your speed. If you drive too fast, they may lose their grip entirely, leaving the vehicle sliding on a film of water. This is known as "hydroplaning." 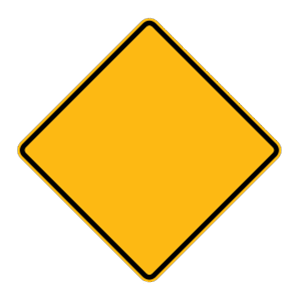 Warning signs are usually diamond-shaped and yellow with black lettering or symbols. They warn drivers about special situations or potential hazards ahead. Subscribe to exclusive driver's content and offers. When do you plan to take your DMV test? Thank You! The email is on it’s way. If you don't get it within 5 minutes check your spam folder!